FORT WORTH, Texas (AP) — With Kouat Noi and Jaylen Fisher back on the court and making shots for TCU, the Horned Frogs looked more like the team they expected to be this season — even after falling out of the Top 25. Both had missed the first three games because of right knee issues before making their debuts last week when the Frogs, then ranked 18th, lost 73-64 at home to Lipscomb. Fisher started but played only seven minutes that night because he didn’t feel right, and Noi was 1-of-7 shooting (all 3s). “It felt like I was supposed to be doing this, all the work I’ve put in, I feel like I was supposed to be here,” said Fisher, who made three long 3s in a 2 1/2-minute span to help get the Frogs rolling against EMU after their slow start. 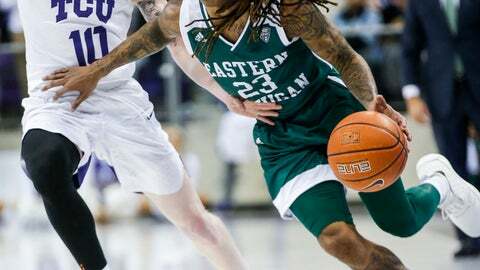 Eastern Michigan (4-4) led 11-2 after Paul Jackson rebounded a Fisher miss, leading to Damari Parris‘ alley-oop pass to Boubacar Toure for a dunk. Kevin Samuel’s dunk on the opening possession was TCU’s only points in the first nearly eight minutes of the game. The Frogs then missed seven shots in a row until another dunk by Samuel started the big run that turned a nine-point deficit into a 12-point lead before halftime. Noi scored 22 of his points in TCU’s 52-point second half against the Eagles zone defense. “Honestly I’m always comfortable shooting the ball no matter what, but it was a good game today,” Noi said. “We’re a team in the making. It’s been pretty obvious to me for a while. Guys have to get their legs underneath them in situations and play with each other,” TCU coach Jamie Dixon said.